Hello there. No, no, I am not dead. 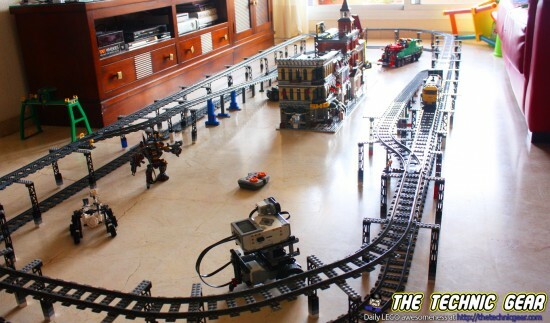 I am so busy that I have almost no time to write here… but I am working actively on two LEGO areas: robots and trains. And today I want to share with you two of my latest creations. I have created two different layouts to work with slopes. First, the longest LEGO Train track with several switch tracks that I have built so far. And then this past weekend I have built a two levels loop using ramp up and down to the sides and Horizon Express. Hello, do you put 2 motors in the tgv? 2 in the front loco or 1 in the front loco and 1 in the back loco? thanks for your answer. How many track pieces did you use on those inclines? I’m in a Condo, so its good to see you can squeeze it in the space. What did you make the raised track supports out of. So far I can tell its lattice tower, black and white and grey brick, and then some kind of length of plank.